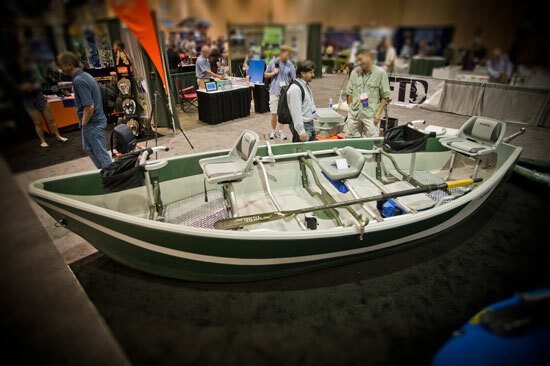 Check out this drift boat… no really… look closer… can you tell what makes it special? It’s inflatable. The Clearwater Drifter ($5995 MSRP) is made of drop-stitch PVC, can be inflated to around 9 psi, which creates a rigid, framed dory that offers the ability to bounce off rocks like a rubber raft, yet track quietly and silently like a drift boat. It’s 17 feet long, and 82 inches wide at the beam between oarlocks. And it disassembles and can back down to a size that can fit in a trunk of a car, or be shipped via UPS. It weighs 300 pounds total (with frame). I’m not sure how a boat that light will do in a heavy upstream wind (no boat I’ve rowed does greatin a wind like that)… but I can see the immediate appeal for many anglers. This is the drift boat for the guy who can’t talk his wife into letting him dedicate a space in the garage, or leave it under a tarp in front of the house.